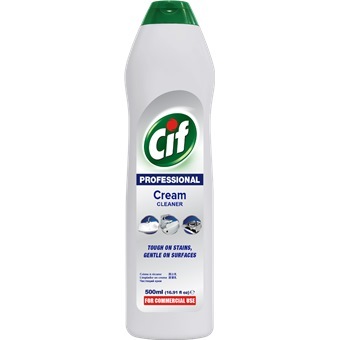 CIF PROFESSIONAL ALL PURPOSE CREAM CLEANER 500ML is rated 5.0 out of 5 by 1. CIF Cream, a revolutionary multi-purpose cleaner designed to tackle tough cleaning with minimum effort. A concentrated creamy formula incorporated with micro particles that are particularly effective on burnt-on food, soapscum and stubborn stains. Forumulated to effectively remove most stains: Food residues, Light Grease, Watermarks. Can be used on ceramic, enamel, stainless steel & chrome surfaces. Rated 5 out of 5 by AlanTan from Great cleaning product Have been using this product for long time. Just need to apply on item to be cleaned and let stay a few minutes. Always manage to clean stubborn stains.